Double Bar Graph, also called double-bar charts, help us to compare or present more than one kind of information, situations, or events instead of just one by using bars. For example, a teacher asked his students about their interest in different games. He found that 20 boys and 15 girls like the game of cricket, while 10 boys and 12 girls are interested in the football. Also 14 boys and 10 girls liked hockey. He asked the students to provide all this information to him properly recorded. Students created single-single bar chart on this. But finally they found that by making a double-bar charts they can give all the information in one single chart. 6. Give two different colors for differentiating two data. 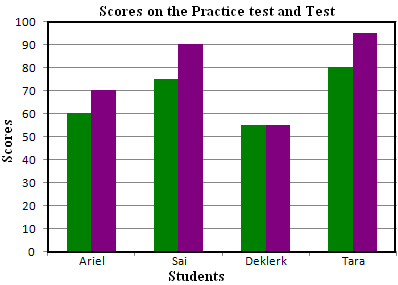 Scores obtained by the four friends Ariel,Sai, Deklerk and Tara in the pretest and test are given below. Using that draw a double-bar graph. 1. The title can be clearly seen from question. 2. We will choose vertical bars. 3. Since the scores differ from one another mostly by 5, 10, 15, or 20, it make sense to chose a scale of 10. 4. We put names on the x axis and scores on the y axis. If we had decided to make horizontal bars, we would have put names on the y axis and scores on the x axis.